Food storage provides assurance that you and your family will have something to eat should some unexpected disaster make getting food or supplies difficult, or even impossible. This disaster could be a long-term power outage, an area flood, earthquake, fire, or other natural disaster, a disruption in family income, a strike at the supermarket, or any other event that makes obtaining food a challenge. Because the time of an event like those listed above is unknown, it’s best to prepare now – there is no time like the present. Clean your basement before storing food in it. Insects often find their way into basements. As they tend to travel along wall bases or to climb up the walls, scrubbing those areas with water and detergent will remove their scent trail, which discourages their friends from following them. Keep your food storage containers at least an inch away from the wall. Bugs will be less likely to crawl onto the containers and into your food. Use containers that seal tightly and cannot be chewed into by insects or rodents, especially for long-term food storage. The safest containers are made either of glass or stainless steel. Watch for signs of mice. Set traps if needed. Look for ways they may have snuck in. Sometimes there are gaps at the sill plate, found between the top of your basement’s walls and the first-floor framing of your house. Openings around pipes or vents are another possible entrance for pests. Just in case, seal all gaps. Control the humidity of the food storage area. Place a humidity gauge where it can easily be read. A reading lower than 50 percent is optimal. If the humidity level rises past 60 percent, you will need a dehumidifier to prevent moisture from entering packaging that is porous or not tightly sealed. 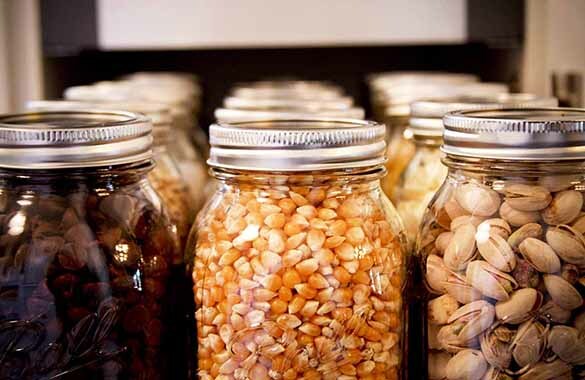 Keep foods that are stored in glass away from light. Establish a routine for checking your stored supplies. Inspect all containers. Early detection of problems can prevent loss. Mark your food supplies clearly with dates of creation or purchase so that you easily can see when a foodstuff is getting close to the end of its safe shelf life. Keep a notebook or clipboard nearby. Maintain a running inventory. Note when you remove food so that you don’t have to rely on memory to know what you need to restock. Rotate your stock. Use the food that is at the front first and put replacement supplies at the back. Alternatively, you can arrange cans or jars on a shelf so that you remove them from one end and add them to the other. Either method ensures that you continually consume the oldest food first so that nothing spoils or becomes unsafe and has to be thrown out. DON’T store foodstuffs directly on the floor. Use pallets or shelving instead. DON’T store onions in the same vicinity as potatoes, and don’t put either vegetable near apples. If you do, the potatoes and onions will sprout. DON’T store tined foods or foods with metal snap lids in a damp room. The cans and lids will rust. DON’T forget to store an ample supply of drinking water. DON’T drink water or consume foods that have been exposed to flood water, fire or toxic fumes. Water and foods that seem safe may actually be contaminated. For your information and convenience, here are a few helpful links to food storage suppliers. Get started today!